Since his graduation from law school, Luca Zampetti follows his passion for art. He was immediately included by critics among the members of the New Italian Figuration and his exhibition activity, begun in 1987, has over one hundred personal and collective exhibitions in private galleries, public spaces and Italian and foreign museums, as well as prestigious awards including the ”Silver Plaque of Arte Mondadori Award in 1994, the final of Cairo Communication Prize in 2003, the Fabbri Award for the Arts in 2007 and those of Combat Prime 2010 and 2011. In 2005 he was invited by Museum of Italian Contemporary Art in America, San José, Costa Rica, at the 51st Venice Biennale of Visual Arts. 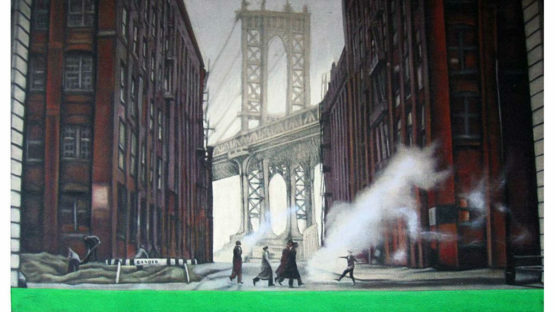 In 2009 his illustrations for the book of Roberto Donati “Sergio Leone – America, nostalgia, myth” were presented at the 66th Venice International Film Festival. In 2011 he was invited by Francesco Elisei to exhibit in the National Pavilion of the Republic of Costa Rica at the 54th Venice Biennale of Visual Arts, and by Vittorio Sgarbi, to exhibit in the Italian Pavilion in the Marche region as a curatorial project of the 54th Venice Biennale of Visual Arte.